The holiday season brings together three of our favorite things: friends, family, and food. So we're teaming up with our friends over at The Infatuation to host a new #aviarychallenge inspired by all things delicious! We've stocked the Supply Shop with everything you need to enhance your food photos, including 2 new, free packs inspired by The Infatuation. Submit your entries by Sunday 11/29. We'll share some of our favorite submissions on our Instagram throughout the contest and announce the winner on Tuesday 12/1. 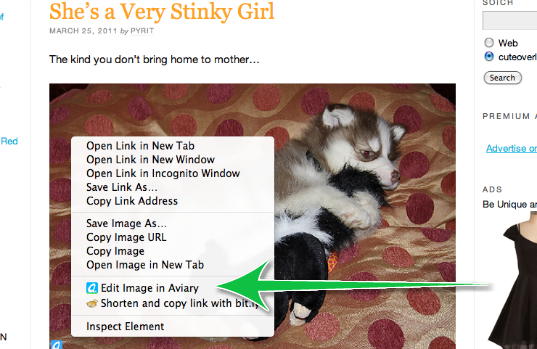 Aviary Education News: Direct Download Buttons! If you're subscribed to our Aviary Education newsletter, you've already heard about these updates. If you're not, and would like to be notified first next time, sign up here! It's the moment all teachers and their students have been waiting for! You've all been patiently relaunching and resaving the apps in Aviary Education in order to download your creations, an arduous process that we despised from the beginning. Luckily, you won't ever have to do this again. 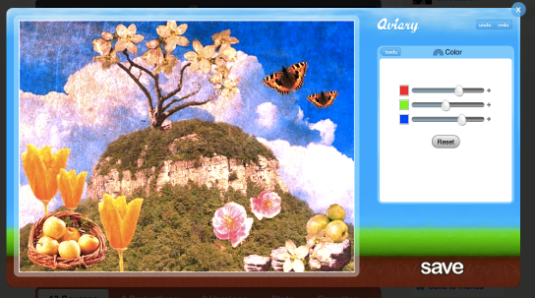 Each creation on Aviary Education (images and audio alike!) now has its own download button directly underneath it. Just click and it'll download - it's that simple! Phew. Please note that teachers can download any creations, but students are only able to download their own. Also, remember that you have the ability to download .egg files (the layered Aviary files) from within the apps to your desktop for backup saving, but this isn't the same as flattening your creation and saving it as a normal image or audio file. Creations are now ordered with most recent first. We added paging, so you won't have to load all creations at once. And in case you missed it, last time we announced the ability to delete teacher accounts, persistent project info, and optional comments. As always, your feedback is invaluable to us. Let us know how it goes, or if there's anything else we can do to make your experience with Aviary Education even better! Email us at edu@aviary.com or follow us @aviaryeducation to join the conversation. We've been releasing a lot of exciting stuff lately (Effects API, flash app updates, the list goes on! ), but don't worry teachers: we haven't forgotten about you! Delete teacher accounts. Fixed the bug that was affecting student accounts when a teacher should have been deleted. We hope these improvements are a great first step toward the ideal Aviary Education experience. We've got lots more coming, and always welcome feature requests and ideas for future versions! Follow us @aviaryeducation to stay updated on new features, and feel free to contact us by clicking the Support button from within your class in Aviary Education or by emailing us directly at edu@aviary.com. Path filters will be especially life-changing for those Aviary users who have been asking us for one feature for ages: text to path. That's right, you can now turn your text into any shape you want with one click!!! You can now add and edit filters (but remember, only on path shapes). Right-click on the canvas with the Transform tool selected, and then right-click on a path in the layer panel, or use the menu in the layers panel. Available filters in this first version: Dotted line, Wave Line, Fat Line, Text to Path. Try them all, there are really infinite possibilities for what you can do with them on top of your vectors! You can’t export filters as pdf/eps (yet). Duplicating a shape won't duplicate the filters. As always, if you can't wait to see the next wave of features, feel free to get a peek at the next updates to our vector editor by signing up at www.aviary.com/alphatester. To try out the new path filters, just launch Raven. Here's a quick overview, if you've never used them before! 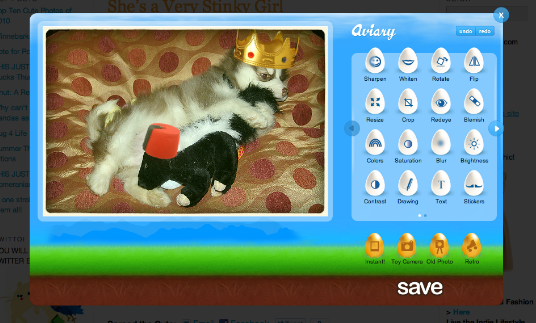 Try new features first: Sign up to be an Aviary alpha tester! We've just implemented an Alpha Tester page where you can get access to all the newest features in Aviary's applications. This is part of an ongoing effort to empower you, the users, to provide feedback on what you like as well as what you wish we were doing differently (previously). Here's how it works: head over to the Alpha Tester page and select "Yes" to activate the experimental versions of our applications. As long as "yes" is selected, opening an application will launch the newest experimental version. We'll always list the current experimental features on this page so you know exactly what to look for. Desktop saving in Phoenix! Backup .egg files to your computer and import them later in their original layered format. A new version of Myna with Roc built in to the interface. Path filters in Raven, which you can access by right-clicking on an object and selecting "Filters." Includes the commonly-requested Text to Path feature! Of course, the most important part of alpha testing is feedback. If you find any bugs, or have an idea for a better way to present a new feature, or just want to tell us what you think, please let us know! You can always contact us through our support site, or you can submit feedback straight through the apps (Phoenix: Feedback>Send Feedback, Myna: About>Send Feedback, Raven: Feedback>Send Feedback). If at any point you want to revert to the stable versions of the apps, either click the "Experimental" button inside the editor to revert, or just return to the Alpha Tester page and change your selection to "No." Please keep in mind that creations utilizing experimental features may not display them the same way in the stable versions of the apps (i.e., if you use a path filter in the experimental version of Raven, it'll display a default path style in the stable version of Raven). We'll also be maintaining this Sticky in the forums with a changelog of all the apps; this is the best way to stay updated on what's new in the experimental versions! 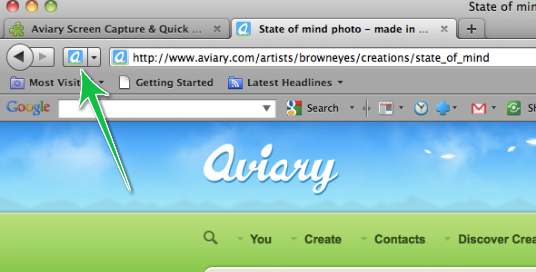 Aviary Extension Updated for Firefox 4! 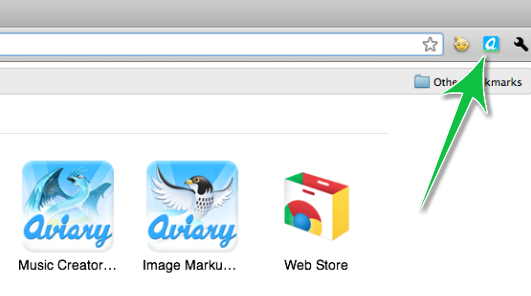 Talon, is now compatible with the brand new Firefox 4.0! Once you're done, you'll find your handy new tool right next to your search bar. Click on the logo to take an instant screenshot, or expand it to reveal a set of different options (you can always change the default behavior in the Preferences): capture a region, capture the visible portion of the page, or capture the entire page. 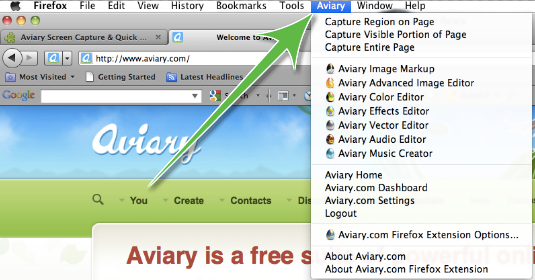 You can also quick launch any of our applications directly from the Aviary tab in the menu bar. NEW feature in this version of Talon: You can now edit any photo on the web without leaving the page with our Simple Image Editor (Feather). 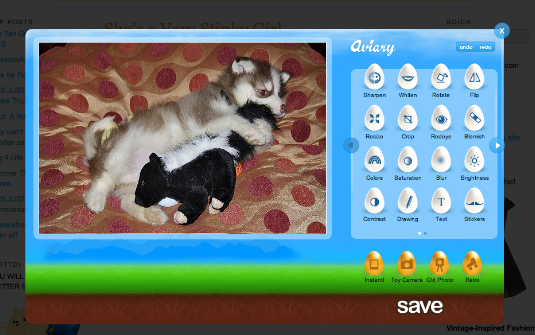 Once the Simple Image Editor appears, you'll have the ability to resize, crop, remove redeye, add effects, and more! 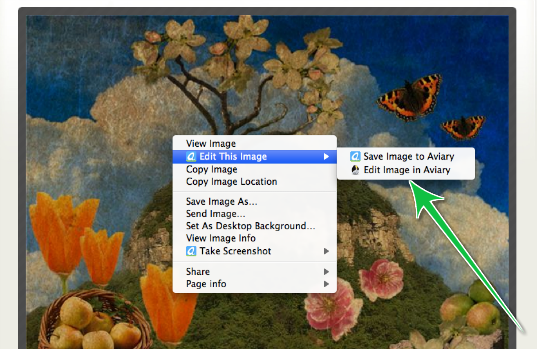 Click 'Save', and you'll be presented with 2 options: you can either save the new image to your desktop, or host it using your existing account on Aviary.com. We hope this new Firefox extension solves all the problems in your life (we're pretty sure it will). Install it now to improve your workflow, save some time, and edit on the fly! Get ready for the best news you've heard since we started 30 days of Roc! Import and export layered .psd files! Improved brush performance. Brushes are noticeably faster and smoother. Larger slider handles for easier control. 1:1 zoom function. The new button located next to the zoom slider will return your view to 100%. Color variation parameter for brush. This new function will randomly switch the color of the brush between the set foreground and background colors. New and improved smudge tool. The smudge brush now fades out, giving a more natural smudge effect. Eraser Alpha controls greatly improved. 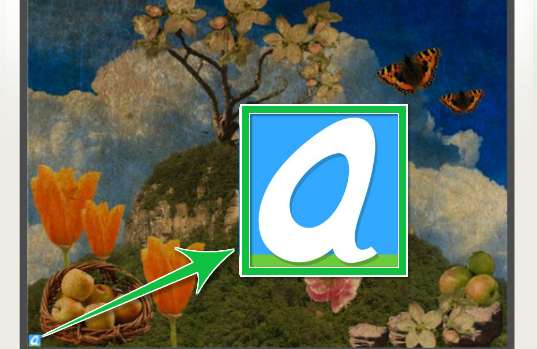 The eraser's alpha is now reflected on the canvas, so you're able to erase at less than 100% alpha. Simple and custom brushes combined into one tool. Layer Masks work with luminosity instead of alpha. They'll now use the luminosity channel (lightness) for masking instead of the alpha channel (opacity). Note: the mask thumbnail in the layers panel is not yet updating. Improved history panel. You'll notice that the items in the history panel now better reflect the actions you perform in the application. Fixed persistent color picker issue. Toucan color palettes will now be retained in the color picker as they should be. Added smart layers. You can now rasterize ("flatten") and edit shapes in Peacock and Phoenix! Merge layers. Rasterize and combine multiple layers to reduce your file size. Better font selection. You can now preview fonts before choosing one. Text background colors. Customize the background area behind a font with its own color. Typographic case functions. You can switch your text between upper and lower case, and set small caps for some fonts. Fixed issue where workspace would dim while picking colors. Fixed an error which was preventing text to flip properly. Added duplicate command. Right click on any object and choose Duplicate to create a copy. Changes in selection/deselection mechanics. Last drawn shape remains selected for a quicker workflow. Note: Press enter to deselect the object and continue working. Changes in text object. Press enter to commit editing, or shift enter to add a new line. Unified effects for text and shapes. The shape and text effects behave the same way for each type of element, for a smoother editing experience. We're really happy to have been able to release these updates, and we can't wait to see what new creations you guys come up with! Now under your linked accounts preferences you will see the option to connect your account to SoundCloud. When connected users create audio files in our audio editor or beats in our music creator, they can now share their creations with their SoundCloud followers. 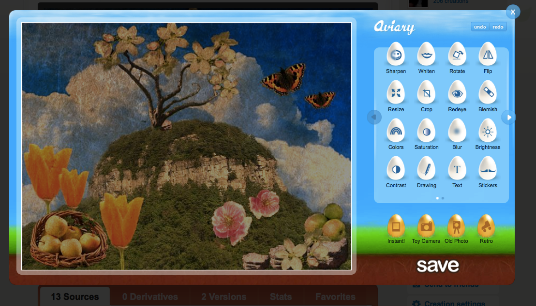 You can also now login to aviary with your SoundCloud account. We've made some updates to our audio applications as well. You can now access your music loops created with our Music Creator (Roc) from inside our Audio Editor (Myna), with the added Roc Beats library! All of you who want to make complete songs from your Roc creations are one step closer. You can add as many Roc files as you can fit in Myna to make your songs. Note: it will take about 5 minutes for a Roc mixdown to show up in the Myna Roc library, and any files made before today might have no tempo information. To help facilitate looping your Roc files in Myna, they are now saved with four measures instead of two. The unlock code has been removed from Roc, so all advanced features are now available to everyone. Thanks to all of you who recommended it to your friends! If you have Flash Player 10.1 installed, you can record locally on your computer. This will not effect most of you, but if you have been wanting to record and weren't able because you were behind a firewall, this little fix will let you record without messing with firewalls. There are several fixes under the hood of both audio applications for those who have been having trouble with saving creations. These fixes should alleviate any of those problems, but please let us know if they persist. We've also added the option to filter by type when you are importing creations into our graphic applications.